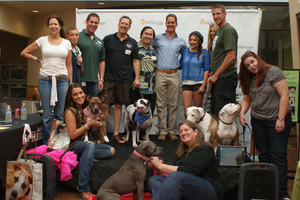 National Pit Bull Awareness Month is upon us, and Southern California is celebrating in style! The San Diego Humane Society and SPCA launched “Dare to BULL-ieve,” a month-long jubilee celebrating the love and companionship of the Pit Pull by commemorating all things bully. On Oct. 6, 2012, StubbyDog Superhero Elite Squad team members Buddy and Barbara, along with StubbyDog volunteer editor Micaela Myers, her pup Barkley and her mom Anne (a big StubbyDog fan! ), were on hand for some of the festivities at one of two scheduled main events. The day included a Bully Beauty Contest hosted by Brad Wills from Fox 5 News. Contest judges included the mayor of Coronado and Pit Bull owner, Casey Tanaka; Mel Makaric from San Diego Home Cooking; Jeff Levitt, owner of Shades in OB; and Geena of 93.3, a local radio station. Booths were set up in the courtyard, including StubbyDog, Even Chance, Puggles & Pitties and the Petco Foundation with their popular “Spin to Win” game. Three Dog Bakery donated the beautiful “Champ” cookie medals for all the doggy winners. For the entire month of October, the San Diego Humane Society and SPCA is offering free microchips, licenses and nametags for Pit Bulls, plus giving discounted rates off harnesses and waiving adoption fees. In addition, all month long they are offering Pit Bull ambassador workshops, puppy fun class, first-aid for dogs and cats and much, much more. What a wonderful way to observe such a joyous month. Thank you San Diego Humane Society and SPCA for not only educating and promoting these wonderful dogs, but also giving current and potential guardians a real sense of community.